Welsh Road is named for the Welsh settlers from North Wales who came down this rough road in the 1700's to go to the grist mill on Pennypack Creek. The last section of Welsh Road, from Mower Street to Roosevelt Boulevard, was completed as an improved blacktop road and dedicated in 1954. The community served by the Welsh Road branch began to develop after World War II, when returning servicemen received government-backed mortgages, and developers like the Korman and Orleans families bought large parcels of land. The Welsh Road branch opened to the public on November 11, 1968. The library was one of the first in the country to be built in a shopping center, although it is really in back of the Northeast Shopping Center. At the time of its opening, it was predicted that the unique location would enable Welsh Road to circulate in excess of 200,000 items per year. That prediction turned out to be remarkably accurate, and it still holds true today. The library has a futuristic design that relies on three walls of glass to add to the interior lighting. The black and white marble mosaic "Space Cage" dominates the entryway, and the preschool center has a carousel theme. The building was awarded the "Distinguished Building Award" by the Pennsylvania Society of Architects in 1970. 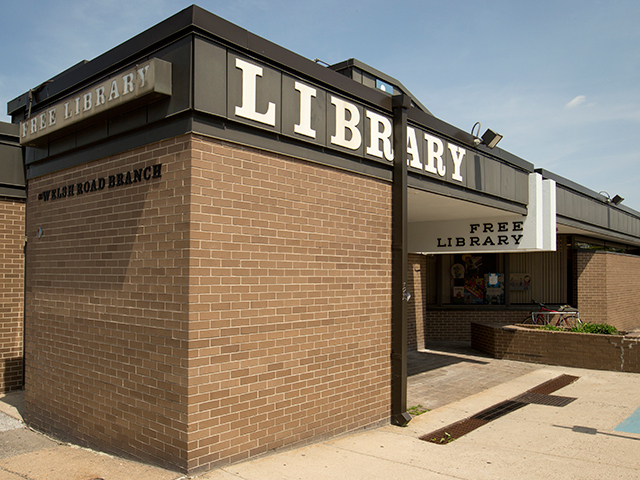 The library was renovated in 1996 as part of the "Changing Lives" campaign, which brought Internet service to every library.